Johann Joachim Quantz (January 30, 1697–July 12, 1773) was a highly skilled German flutist, flute maker, and composer. He was born in Scheden (Oberscheden), near Göttingen, Germany in the late age of Classicism, and died in Potsdam. As Quantz sought to develop the flute into an instrument of a wider range with more flexibilities, he clearly felt a fundamental need to make a meaningful contribution to the woodwind instruments which then were not looked upon as important instruments in eighteenth century orchestration or chamber ensemble. He brought a strong objective worth to woodwind instruments and especially the flute which has benefitted the world of music richly. Quantz began his musical studies as a child with his uncle because his father, a blacksmith, died when Quantz was young. He later continued his musical studies and career in Dresden and Vienna, Austria. Subsequently he went to Warsaw, Poland. It was during his time there as a court musician to Frederick Augustus II of Poland that Quantz began to concentrate on the flute, performing more and more on the instrument. He gradually became known as the finest flautist in Europe, and went on tour through France and England. He became a renowned flute teacher, flute maker and composer to Frederick II of Prussia (Frederick the Great) in 1740. He was an innovator in flute design, adding keys to the instrument especially to help with intonation and playing in tune. Even though Quantz concentrated on the flute and wrote flute sonatas and concertos for the mildly toned woodwind instrument, Quantz also wrote trio sonatas and vocal music resulting from his interests in many forms of instrumental combinations. The flute was later modified between 1832-1847 by Theobald Boehm because of Boehm's hope to create a larger tone for the flute. It is a credit to Quantz in creating compositions which featured the flute at an earlier time when the instrument would have been overwhelmed by other woodwind instruments. 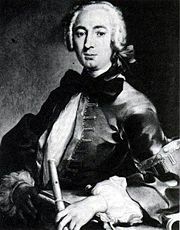 Although Quantz wrote many pieces of music, mainly for the flute (including nearly 300 flute concertos), he is best known today as the author of Versuch einer Anweisung die Flöte traversiere zu spielen (1752), a treatise on flute playing. Although the treatise is of great interest today as a source of information on authentic performance practice and flute technique in the eighteenth century, only a third of the work addresses the flautist's role. The rest of the work speaks of ornamentation, accompaniments, and the criteria which would best be used to evaluate the merits of a composition and performance or performer. History of "Johann Joachim Quantz"
This page was last modified on 11 May 2018, at 16:28.